Engraver: Forster, J. 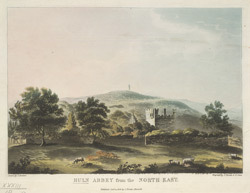 & Jukes, F.
View of Hulne Priory in Alnwick Park, Northumberland, one of six views of Northumberland by Forster and Jukes. The Priory is situated in the park surrounding Alnwick Castle. It was built in the 13th century as a Carmenite Priory for White friars of the Orders of Mendicants- who choose to live in extreme poverty. The church is long and narrow being 123 feet wide and only 26 feet wide- being so narrow there were no aisles. The Priory complex which included a gate house, prior’s lodge, cloister and chapel was surrounded by a high stone wall- this is because of the frequent unrest in the area due to its being on the border between Scotland and England. The Abbey was closed in the 16th century during the Dissolution of the Monasteries.